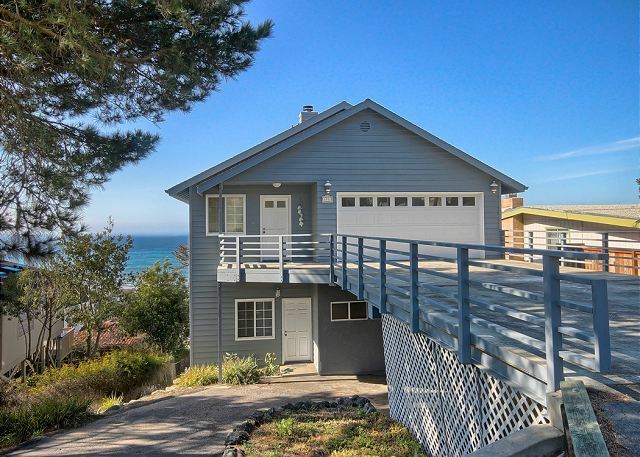 Quaint Ocean view home perched on top of Lodge Hill in beautiful Cambria California. 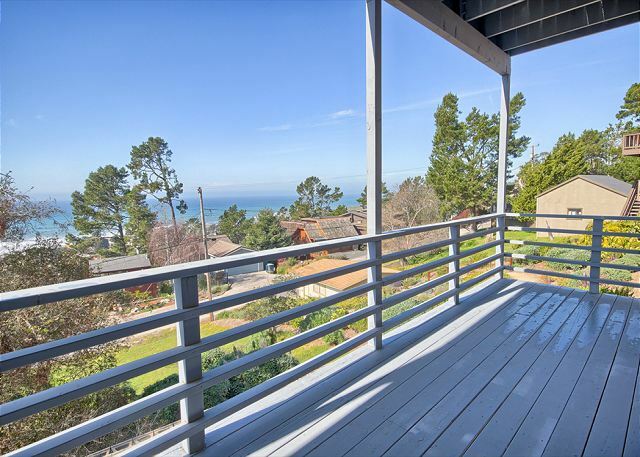 This 2 bed 2 bath home has amazing panoramic ocean views, from Ocean Pines to Piedras Blancas Lighthouse. Relax by the fireplace, enjoy a glass of wine, and gaze out into the sunset at this wonderful home. This home is not pet allergy free. From beginning to end, my third stay at this awesome home was perfect! A wonderful base for outdoor adventure ! Perfect location, home was even better than the photos. Breathtaking view.Five of the the most enjoyable vacation days we've ever had. Incredible views! Charming town, great stay! We loved our stay, the ocean views were truly incredible and the home had everything we needed. It is in good condition, clean and inviting for a fair price. The only issue for someone in our group is they had no service on phone and homes WiFi didn’t work. We asked about WiFi and were told sometimes it goes out. For ppl who need connectivity this may be an issue but we had general phone service and loved to unplug it was still a great experience! I have stayed at this location numerous times and each time I come I see improvements which is great. Now just to get a new shower head and get the knobs on the oven fixed that would be wonderful! I did have problems with both TV's and had someone from the office come out to look at the TV in the bedroom and she couldn't figure it out either. She said she would call the owner and get back to me which she never did. Other than that it was a great stay as always. I loved this home. It was the perfect place for two couples. 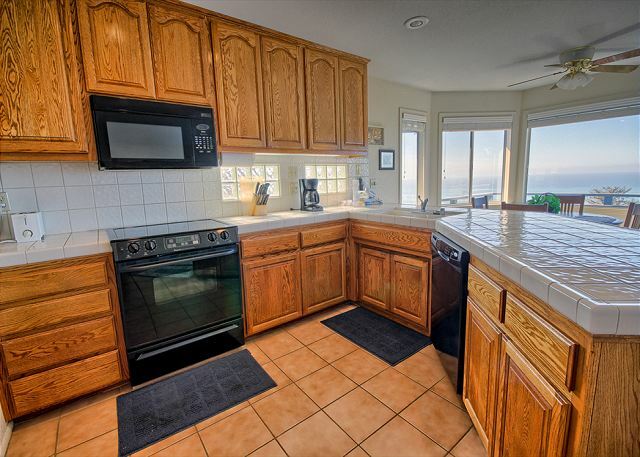 We totally enjoyed the convenience of the property and LOVED the views of the ocean. What a perfect place to sit outside, relax and take in the scenery. The home was also very well furnished, beds were comfortable, and was really clean. Communication from the property management company was excellent. The only downside of the property was that some of the amenities were not very well maintained: stripped knobs on the stove, water in shower went from scalding hot to icy cold for unknown reasons, and coffee pot did not work which was a major pain for our fellow coffee-drinking travelers as we had to go into town to buy coffee each morning. And I know this has been a lingering problem as I have seen it in other reviews from several months ago. My stay lived up to my expectations. I plan on returning asap. I stayed here with my mom so we could easily visit Hearst Castle. The house was better than I though it would be. 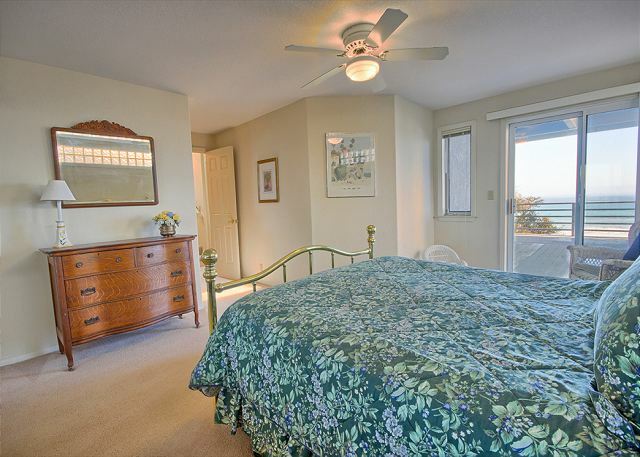 It is nestled on the top of a wooded hilltop overlooking the ocean and has fantastic views. The house was carpeted and tiled and very quiet. I would definitely stay here again. We love this home which is perfect for two couples. We have stayed here at least five times. The view is amazing and the house is very comfortable. We enjoy cooking so would highly recommend the owners invest in a new stove as the current one has issues; also, a new coffee maker is needed. Otherwise, it's a gem! We hope to return again next year. We really enjoyed our stay at this house. The people at Breen Vacation Station made the check in and out very easy. Such a break from the fires back home! Being evacuated from the Thomas Fire, we were so thankful to find refuge in the beautiful home with all the comforts of home. The views are breathtaking and listening to the comforting sound of the sea was truly wonderful. We hope to return next week, as the fires re spreading and we feel so comfortable there. We have rented this same house every fall for 4 or 5 years. We always find new things to do in the area. This year we made it to the night tour at Hearst Castle. But more importantly we come away relaxed and wanting to stay longer. It was pleasant and the house was very clean and most everything that one needs to spend a week in Cambria was there. we were very happy with this house it was very clean, beautiful home. Its the same color as our house even the color scheme of the living room were the same as my house. The ocean view was great loved it. Super from check in to check out. The Breen group was great to work with and very helpful with things to do and places to see in the area. The house was fantastic, clean, had great instructions, and had the amenities you needed. We loved this house. The house is very comfortable in every way. Loved sitting on balcony every morning watching he ocean. Very serene and peaceful setting. Would definitely return. 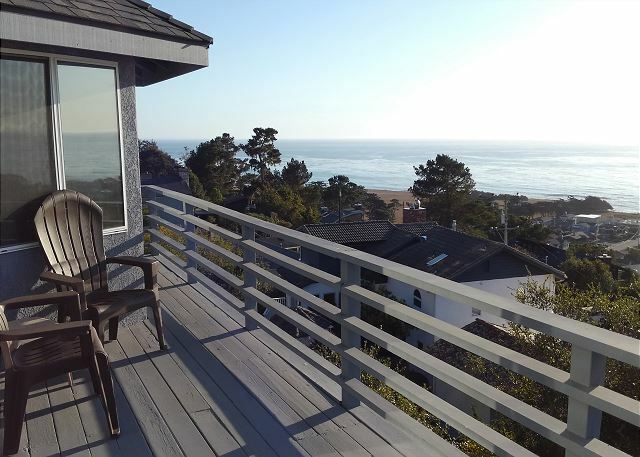 Gorgeous view and this home was reasonably priced for beach view property. However, I think you get what you pay for in terms of the furnishings, etc. Beds weren't great, no patio table or furniture and watch out for the railing on the balcony. Dangerous and should be replaced I think. I have stayed at this home on numerous occasions as I love the view, the quietness and the cleanliness of the home. However as a another reviewer wrote, it truly needs a new bathroom shower door. The current one is very dangerous. And the mattress in the master bed is totally worn out. TV wasn't working so there should be a note on it. It's been like this for years but they seem to do nothing about it. I do a lot of my own cooking and have learned what to bring. Thought I might find some salt but not even a grain. And the glassware in the cupboard even had lipstick on it! So housekeeping needs to do more checking. Although I will continue to come back the owners need to take responsibility for some of these items that need to be fixed. had a great time. loved the location and view. property was extremely clean. management team great to work with. Great views and cozy atmosphere! We loved our stay at this property! The views are truly amazing from every room in the house. 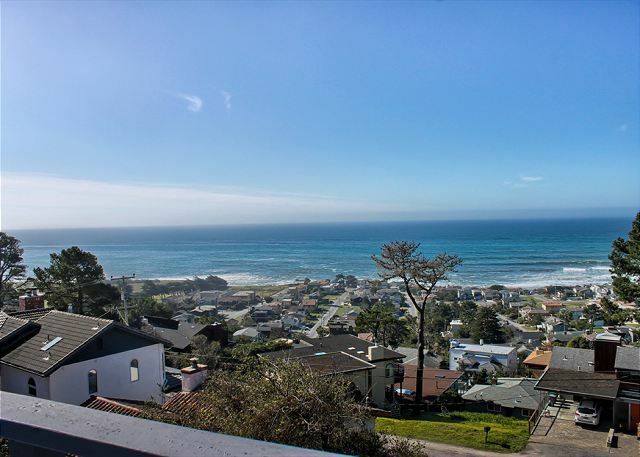 The house was clean and well maintained and the location very convenient to the beach and Hearst Castle. The heater went out during our stay and we called after hours and someone came right away with a space heater. The next day a heater tech came and fixed it. Appreciated the prompt service. We had a wonderful time and enjoyed our 15 day stay here. Plan on returning as soon as possible. We celebrated Christmas with our grown children and found the house well-stocked for all our cooking needs. The house is exceptionally clean and well-maintained. The photos do not lie. 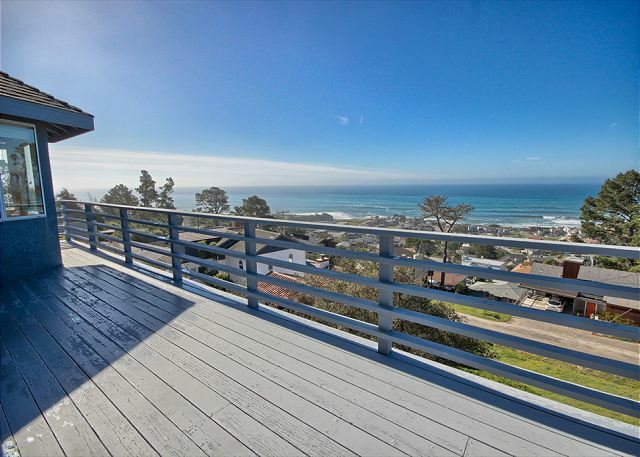 We'll have to make a trip back to Cambria in warmer weather to enjoy the deck however the views from the windows (every room has a view) could not be beat. Alan R from Culver City, CA does not recommend this vacation rental. Refer a friend? Not sure. Maybe if the maintenance improves, along with the quality of all plumbing fixtures. Shower door glass in Master Bath is dangerous. The doors fall out of the tracks when moving. Leaking(kitchen) and hard to adjust sink faucets. 2 of 8 bulbs out in Master Bath. 1 porch bulb burned out. Master Bath toilet seat loose enough to slide off! Invest in King beds, 2 more stools for kitchen counter, replace terrible couch in Master Bedroom (or a couple more chairs), and new and better water saving shower heads. Everthing else was fine, especially the view, but actually, the view from the downstairs Master is partially blocked by a really ugly tree. I love trees but this one is in the wrong place and very overgrown. The view from this house can not be beat! We had a wonderful time. This house works great from 2 couples. Wonderful relaxing weekend get away. The property was everything the description said it would be. It was clean and well maintained. We had a very relaxing comfortable weekend. We would rent this property again. It was a delightful 11 days at Heavenly Ocean View. The accommodations were comfortable & inviting. We loved the ocean view and daily walks along the ocean bluffs. Nice, quit neighborhood with no "busy" streets nearby. Plenty of room. Easy access from garage to main living area. Beautiful view. Convenient access to lower level with your car. This was the second time I had stayed in this home and it will ALWAYS be the home I will rent when visiting Cambria. Have tried others but nothing compares to this. 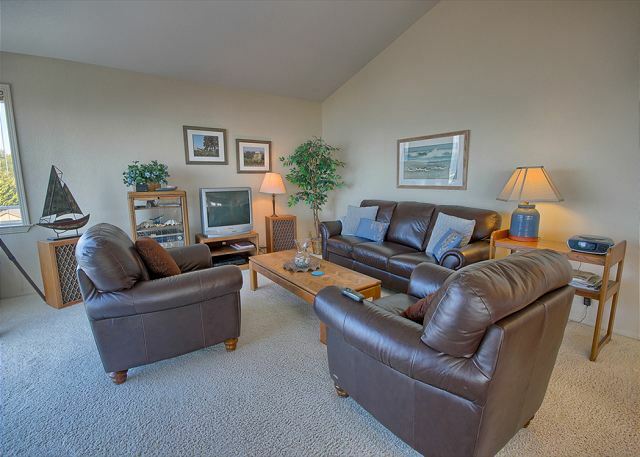 It is very clean, rooms are large and the view is priceless! I did drop down the hill for a walk. There is a 40" flat screen tv in the living room. All you need is a HDMI cable to connect your computer to the tv and use your own Netfix, Amazon or HBO GO or anything else right from the computer. Suggest a wireless mouse that you can use right on the tv. This was a lovely home, very clean and comfortable and described perfectly in the material. And a GREAT view. Constance S from Los Angeles, CA does not recommend this vacation rental. My boyfriend and I took a trip to Cambria and stayed here for 3 nights. 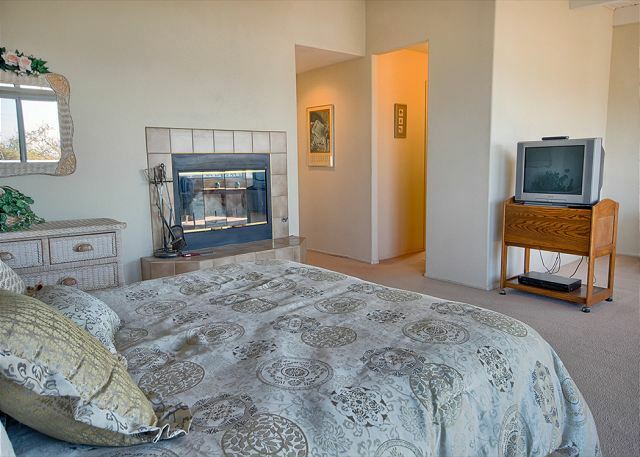 We loved this home, with 2 fireplaces, ocean view,2 balconies, it was a great vacation spot. I would stay here again! My only criticism would be the pots and pans need to be replaced and the tv's were small and old..other than that an excellent place! Breathtaking! We stayed with friends for a much needed stress-relieving break. This house was just what we needed. Beautiful views from every room. Enough private space and the perfect size for sharing meals and conversations. Can't wait to book again (and again)! This was our favorite home rental in Cambria of the several we have previously rented. We loved it so much that we have already reserved it for our 12th Anniversary and all of March 2017! The only things that we would like added is a new master bed and a little bit better stocked kitchen. We love this place---was our 3rd stay & plan on coming back next year, too! The weather not as sunny as prior year, but a bad day in Cambria is still a good day. Heavenly Ocean View was just that! More then we expected. It was so pleasant that we simply spent more time inside the house enjoying the incredible views. Best vacation ever. Our vacation in Cambria wasn't what we had planned. I ended up having to go to the ER several times because of a spider bite that I got in Solvang the night before we arrived. However, having a wonderful home to return to everyday after treatment was so helpful. We were able to relax on the balcony and watch the sunset. The home is very comfortable and cozy. The kitchen is lovely and the dining room has beautiful views as well. The beds were comfortable the linens for soft it was the perfect relaxation getaway home. We loved watching the deer that came into the yard and throughout the neighborhood. My family (mom, dad & 2 teenage boys) had a great time at this house. Lots of extra linens and towels! Fun games, which gave us lots to do in the evenings. Great walks to the tide pools and The Ranch. Comfy beds and furniture. We would stay here again! 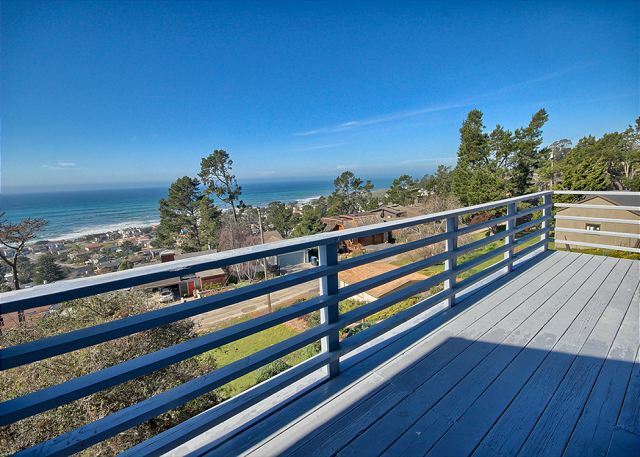 I was able to view the home last year while staying at another location in Cambria. It appears very simple from the street view but really surprises you upon entering. The views are spectacular, the house is spotless and very, very comfortable. I would definitely return!! I had rented from Breen two years ago and you just can't beat their friendly service. We had a wonderful week long stay. We have been to Cambria many times, but this was the first time we rented a home. Heavenly Ocean View was a lovely home to stay in. Clean, comfortable, and perfect location. I would suggest updating the website information to include a 1/2 bath on the 1st floor. We almost passed on this property since we thought the baths were all downstairs. We are in our 70's and didn't relish the idea of going up and down the stairs to use the baths. Also, knowing patio furniture was available would have been helpful also. The Breen staff was very friendly and helpful, but I was surprised they could not answer some simple questions on the property without having to check and get back to us. (i.e., was there a bbq? Were all bedrooms on the lower level?). I'm sure it would be very helpful to the staff if they had ALL the details of each property at their fingertips when a potential rental inquired. When beds are due to be replaced king size would be most welcome. Both bedrooms are large enough to accommodate them. Softer sheets would also be appreciated. Having the DVR in the living room rather than in the msster bedroom would allow all guests to view movies together. On this trip we took the Lighthouse tour - wonderful and informative. Also Paso Robles wineries, and the Friday night music and food at Harmony. Of course shopping in the lovely town of Cambria. Our favorite restaurants are: Moonstone Beach Grill, Robin's, Madeline's, Sow's Ear, Linn's. And in Templeton - McFee's! Wonderful food. We were very surprised at how poor the service was at Moonstone Grill and Linn's this trip. We will return to Cambria as often as possible. This is a beautiful home. It is very comfortable, great deck, close to the ranch preserve and beach. Enjoyed Hearst Castle and the tour of the lighthouse. Great restaurants in Cambria. It was a comfortable and pretty furnished house with a nice view on the ocean! Loved the visit to the Heavenly Ocean View property. And it was heavenly. Great views from all over . My only complaint is that the two queen beds are very old and uncomfortable. I recommend buying new king size beds - not sure why queens where there. Also the comforter and sheets where very old and needed to be updated. They where not at all comfortable. Besides the beds everything was awesome ! This is a very nice vacation home. 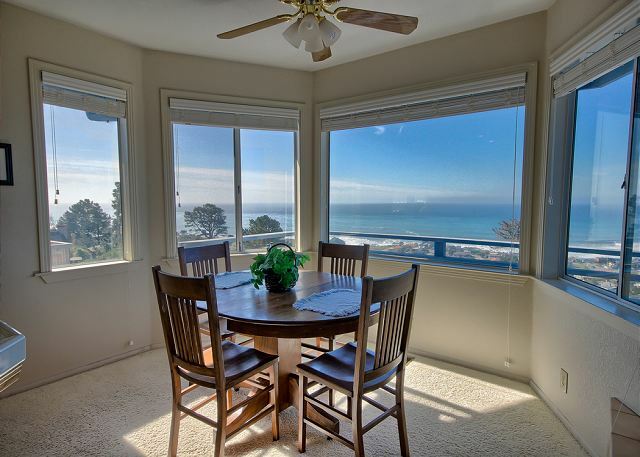 Great views, beautiful sunset, conveniently located to all beaches and Hearst Castle. Main Street is a few minutes away where you can find good restaurants. We will definitely come back. 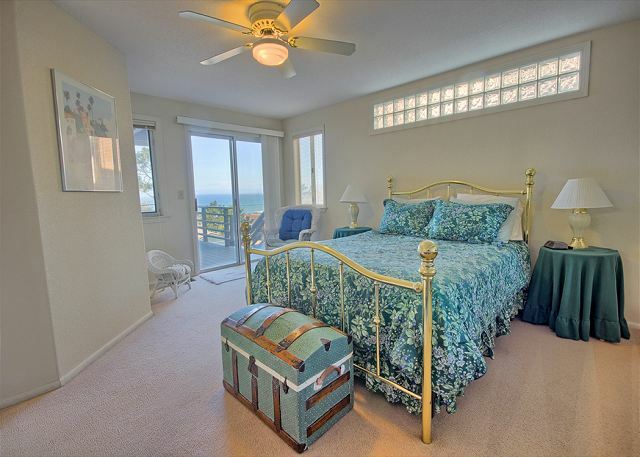 A lovely 2 bedroom home with exceptional ocean views. 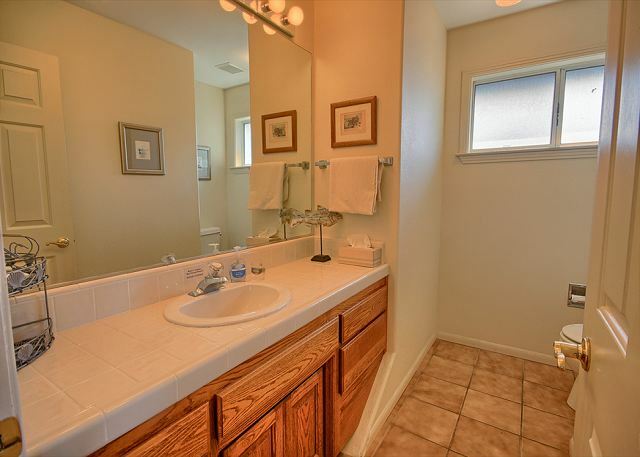 This is a beautiful home that is very well maintained and accessorized. We wish it was our home. It has all the amenities for comfort. Very nice house. Clean. Well kept up. Great views. Easy to get to from town. A nicely designed house that makes the most of the ocean views. We had a wonderful time in Cambria. We met our friends who live in northern Calif (we live in So. Cal. ), finding it to be a good half way point. Our husbands were room mates at Cal Poly 40+ years ago, and we see each other about 2X a year. This house was perfect for two couples. Each with a nice bedroom and bath. We really enjoyed walking along the bluffs at Moonstone Beach and visiting all our favorite spots for great food. Ducky's in Cayucos, and Madeline's in Cambria were among the best! We will be back! We stayed at the Heavenly Ocean View house on Saint Thomas Ave. The house was clean, updated, and well supplied. 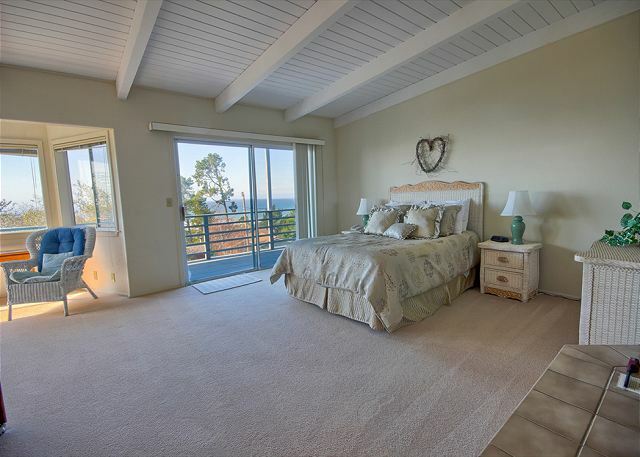 (the photos on the Breen website are accurate and current) Each bedroom had it own patio door with the view of the ocean. Plus, each bedroom had is own full bath. The living room, kitchen, entry and an 1/2 bath were all on a separate floor. I could get up early without disturbing our friends in the morning. Plus, the neighborhood was quiet and we never felt unsafe. The views were excellent. You could still hear the sound of the waves, as well as, hear the seals in the distance and no other homes blocked the view. The sunsets are unforgetable. Even the morning sun rise from behind was enjoyable. The balcony was a perfert spot to watch the deer, several turkeys, bats, blue jay like birds and one skunk. Overall, I have nothing negative to say. The stay was much more than I was expecting. My wife and I and our friends are both pleased and happy with the experience. Great home puts you in the catbird seat! This wonderful home has panoramic views of the ocean for nearly 180 degrees. It's situated at the top of the hill with no obstructions in front of it, in the quiet area of Lodge Hill. I like the way the driveway takes you straight into the top floor, and you can pull your car down to the lower floor to unload as well. Great design. Decks on both floors. I'd say the furniture leaves a bit to be desired, but not really worth complaining about. 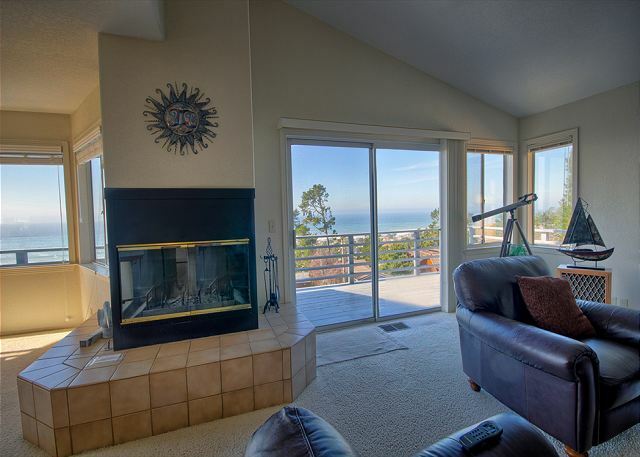 This home has an awesome view of the coast! 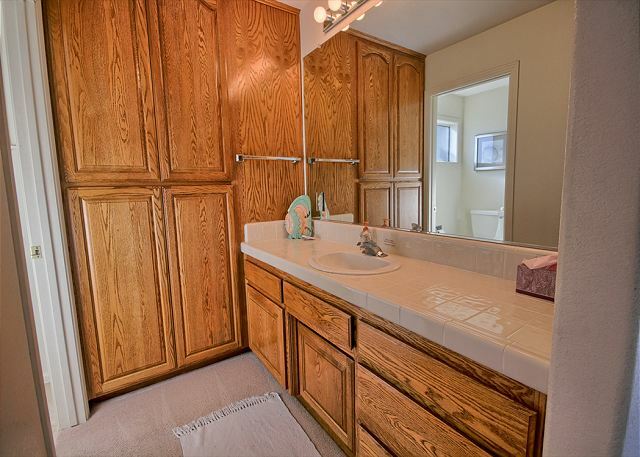 We love the privacy the home offers. My only complaint would be new carpet, blinds that work on the sliding glass door area, and a BBQ gas grill. We enjoyed this home. It is a good base for sightseeing in the area. We especially liked the great deck. This home's interior is visually great and very, very comfortable! The greatest aspect of this home is the incredible panoramic view of the ocean from every room except the bathrooms and hallways! We want to go back! We so enjoyed our stay at Heavenly Ocean VIew. The place is very comfortable and the view amazing. We went with some dear friends and spent a lot of time lounging around, visiting, and enjoying the view. We would rent the property again in a heartbeat! We were greeted professionally and promptly by the Breen Vacation Station, received our keys and enjoyed a beautiful house with ocean view. The house was perfect, we traveled with two friends and we had plenty of space, were able to enjoy a fire in the fireplace, it was a great location to enjoy the winery's in the area, Hearst Castle and many other great sites. Cambria is a wonderful little town with great food and friendly people. We will return to the area and to the house. Property was clean & comfortable. Had a very good view of the ocean. 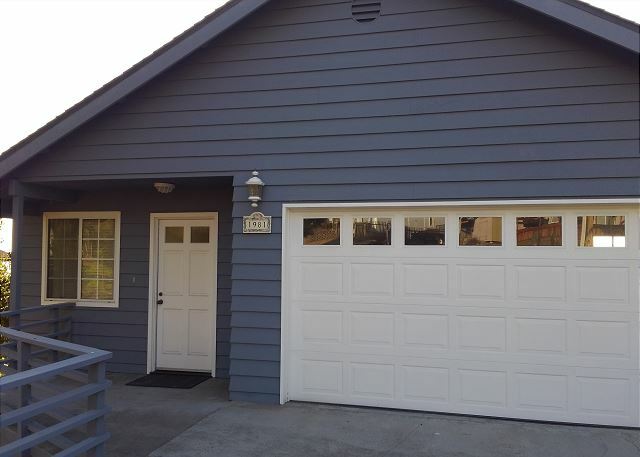 Close to downtown Cambria, with great restaurants. Would recommend to anyone who wants to relax and enjoy the scenery. So titled because it was the first stop of a 10 day sort of spontaneous vacation. Planned on staying in Cambria for the first part and the rest was just pot luck. The great thing about our first days in Cambria was that it set the tone for the whole trip. Things couldn't have been better. From the first the people at Breen were extremely professional and helpful answering questions and making suggestions. It was all very painless from making the reservation to paying the bill. House and location were great, and the nearby otter cove and bluff walk are not to be missed. We did have a few wrinkles. The coffeemaker didn't work, there were no ice cubes or trays, and we were unable to use the phone, even for toll free numbers. That was problematic since there is no cell service at the house. Also, the carbon dioxide detector went off at 2 am on our last night and repeatedly told us to evacuate. We determined it was a false alarm but it was disconcerting! The best thing I can say is -- I'm going back. And back. And back. The view was as incredible as the photos. The house was so cozy and comfortable that we felt "at home" immediately. The layout -- each bedroom with private bath was perfect. It even had the luxury of two driveways so we could unload the luggage at the bedroom level and the groceries at the kitchen level. The Breen office couldn't have been warmer or more welcoming. We will be back. Gorgeous views of the ocean, beautiful sunsets. The house was perfect. We loved watching the deer in the yard. A great location for exploring the Cambria area - shopping, wine tasting, dining. Many excellent restaurants. The Elephant Seals up north by San Simeon are a must. This was a beautiful property in a great location. The home was very clean and well maintained. It was exactly as described on Breen Vacations website. We have already recommended the home to some friends. Everything about this house and location was perfect! The view is just what we were looking for, the house was incredibly clean, and comfortable. Working with the Breen company was a joy. Everything was done well and professionally. Wish we could have stayed longer....and next time we will. We could not have found a more perfect place to stay. It was like staying in your home away from home. Everything was there. My husband is a gourmet cook and had all the supplies at his fingertips. We had the best view,best weather, and the beds! I would recommend(and have) to everyone. FABULOUS! Excellent property, clean, comfortable , great views, strongly recommend! !